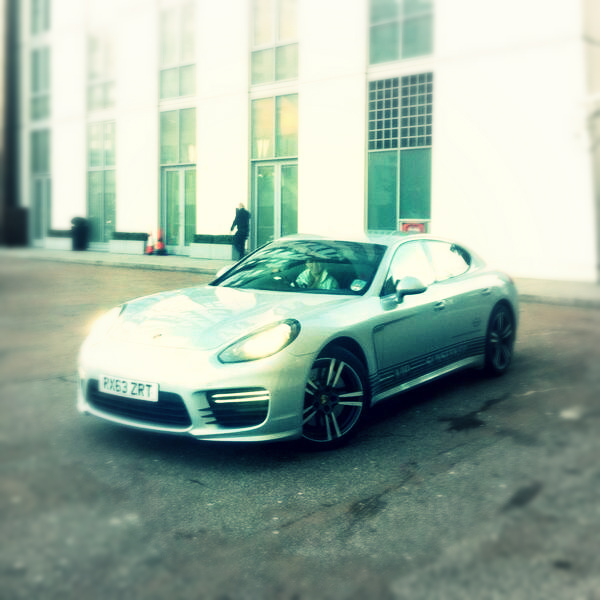 Of course, the first day is often one of the most exciting and popular, and the London Boat Show did not disappoint. As the doors of London ExCeL opened at 10am, by 10.15am the Sunseeker stand was full of clients and yachting enthusiasts admiring the 2014 range on display, from the Portofino 40 all the way through to the 40 Metre Yacht out on the Docklands water. At noon crowds gathered at the foot of the Sunseeker display to catch a glimpse of one of Britain’s most famous exports, comedian and actor James Corden. James joined Sunseeker founder Robert Braithwaite CBE for the launch of the all-new Sunseeker 75 Yacht, introducing the fantastic 4-cabin flybridge yacht to the World’s media and public. Onlookers were entertained with some jazz and swing style classics from 1950s style girl group, Elle & The Pocket Belles. In Sunseeker VIP hospitality, James Corden kindly spoke to media and press partners about Sunseeker, joining Robert in a number of interviews to support the British brand. The second day took us to the newly designed Sunseeker Brokerage stand, which was positioned at the foot of the main stand adjacent to the Sunseeker Champagne bar this year. Showcasing a number of brokerage and Dealer Approved vessels currently for sale with Sunseeker Brokerage, clients had access to over 400 specifications of boats for sale with the Sunseeker London Group at the show. Whether it is a Martinique 36, Camargue 50, Portofino 48, Manhattan 50, Predator 60, 86 Yacht or a Predator 108 you are looking for- all boating requirements are catered for by the Sunseeker Brokerage team in 17 offices worldwide. Crowds gathered once again near to the Sunseeker stand as yacht tender suppliers Williams Tenders teamed with BBC F1 presenter Suzi Perry to launch an extra special 325 Turbojet at the show. Sporting a hot pink colour scheme, the uniquely customised tender was auctioned on eBay throughout the show in support of Breast Cancer Care’s FAB1 Million campaign. The final bid was placed on Monday 13th January, raising a staggering £16,100 for the charity. Bloomberg TV visited the Sunseeker stand at the London Boat Show to make a report on the yachting industry. Commenting on the recent increased sales within the superyacht market, exemplified since by Sunseeker London Group’s £25 million boat sales at the show, the below online video indicates positivity for Britain’s marine industry, worth a reported $4.7 billion in 2013. The Sunseeker San Remo is an award winner! Clinching the “Best sportscruiser over 45ft award”, the 2-cabin performance cruiser beat the likes of the Princess V48 and the Fairline Targa Open 48 to the coveted prize. Famed for her exceptional manoeuvrability and sporty looks, the San Remo proved very popular on the Sunseeker stand both before and after her award-winning success. Tuesday also saw corporate guests welcomed to the Sunseeker display, with Rolls Royce Sunningdale, The Luxury Network and Silvia Campbell shoes collaborating at a unique affinity marketing event with Sunseeker London. Showcasing gorgeous bespoke shoes, Rolls Royce cars and luxury networking opportunities, guests enjoyed champagne and canapés within the Sunseeker VIP hospitality area. 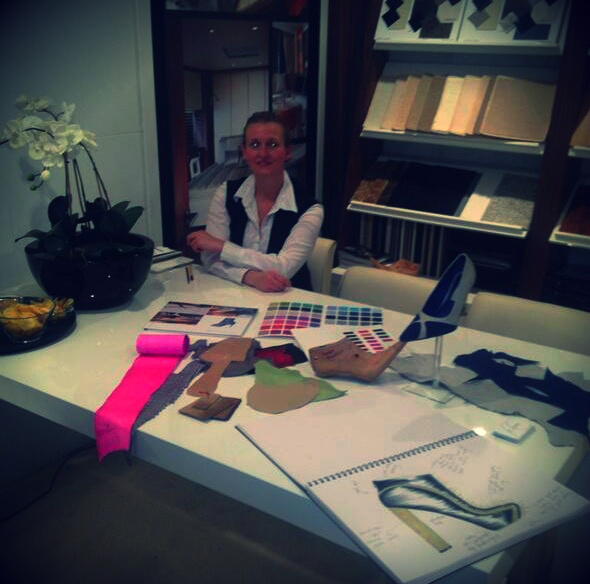 The events and parties continued on Wednesday – Day 5 of the show – which the halfway point reached at London ExCeL. 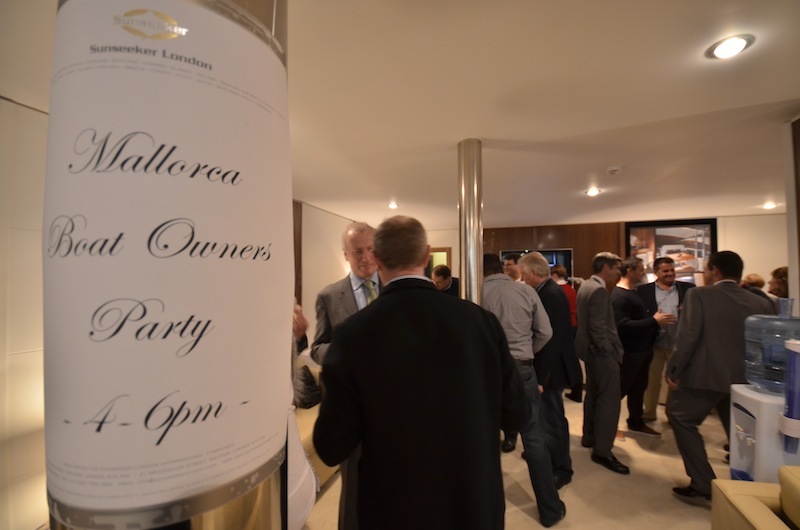 The Coleman Group, which works closely with Sunseeker distributors and clients on a number of insurance policies, hosted a VIP champagne reception on the Sunseeker stand, welcoming a number of private clients and managing agents. Guests toured the Sunseeker yachts on display with members of the Sunseeker sales team, who were on hand to answer all and any boating queries. Thursday evening of the show saw the Sunseeker stand practically raise the roof of ExCeL London, and bands and musicians took to the stage to entertain attending guests of the late night opening. Elle & The Pocket Belles returned from Saturday’s 75 Yacht launch to perform a fantastic 1950s swing and jazz set, whilst soul singer Jodie Elms reminded onlookers of the strong Sunseeker bond (more specifically, James Bond) – the brand has enjoyed with a certain agent 007 in recent years. Down at the Sunseeker Champagne bar, something a little different was taking place. Sunseeker International’s very own band “The Sunseeker Renegades”, formed from employees of the shipyard itself, played a string of impressive rock and pop hits that had friends and supporters on their feet within minutes. Meanwhile, guests from Canary Wharf-based Citibank joined Sunseeker London for an exclusive champagne reception. A wonderful turn-out of private clients enjoyed the evening opening, where they were able to take in the full boat show experience from the comfort of the Sunseeker VIP hospitality area. Yet again the parties continued on Friday as not one, but two, exclusive events took place in the evening. Sunseeker Poole hosted a magnificent ‘launch party’ for the owner of the Sunseeker 115 Sport Yacht, who kindly allowed her to be displayed at the show. In true Sunseeker style, fifty of the Owner’s guests were collected at a secret location and chauffeur driven in Porsche GTS sports cars, kindly supplied by Sunseeker London Group partners Porsche Cars Great Britain, directly to the spectacular 115 Sport Yacht awaiting them on the Docklands Water, where guests partied the night away with the lights of Canary Wharf in the distance. Sunseeker Mallorca and Sunseeker London hosted a unique “Mallorca Boat Owners Party” within the VIP area of the stand. Together with the best of the Spanish island’s lifestyle brands – ABC Mallorca, Sloane Helicopters Mallorca, Castell Miquel wines and Jumeirah Port Soller Mallorca – Sunseeker Mallorca welcomed their clients, who enjoyed one-on-one tours of the Sunseeker models on display whilst learning about the latest Sales and Service developments in Port Adriano and Portals for 2014. The second weekend of the London Boat Show once again proved very busy for Sunseeker, as thousands of visitors came to see the incredible display and pick up a copy of the the latest Sunseeker Magazine. 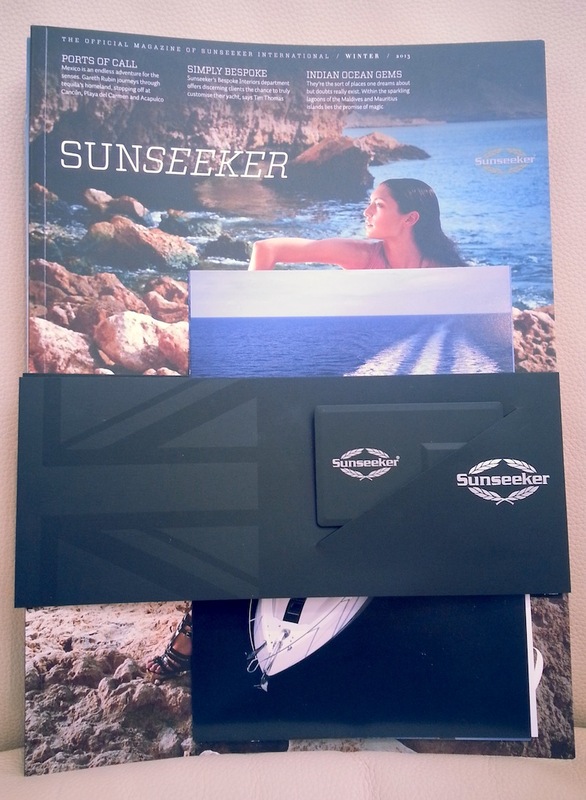 This year the luxury publication was accompanied by a credit card style USB that details the much sought after information on the 2014 Sunseeker range. Make sure you look out for these at the next Sunseeker event you attend! 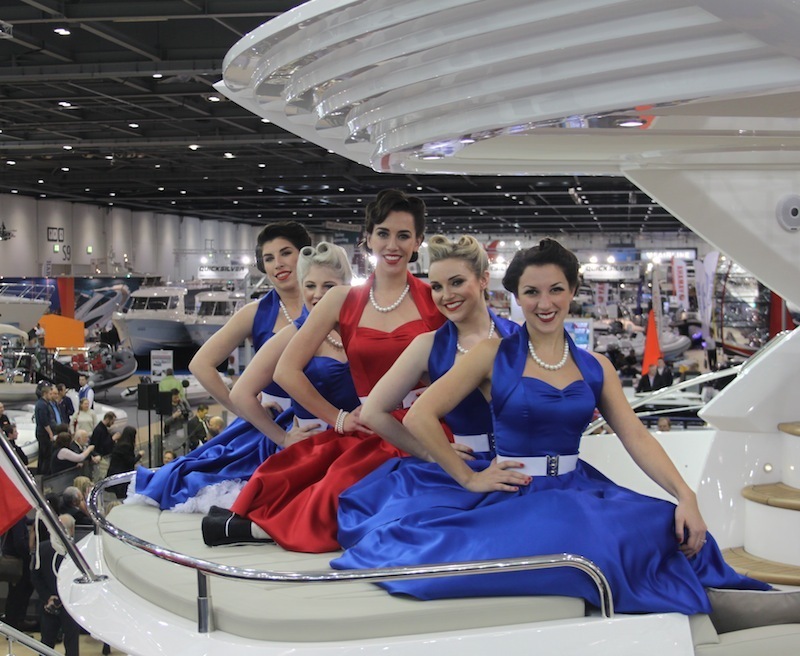 Sunday saw the 2014 London Boat Show draw to a close at 6pm, but not before going out with a bang! 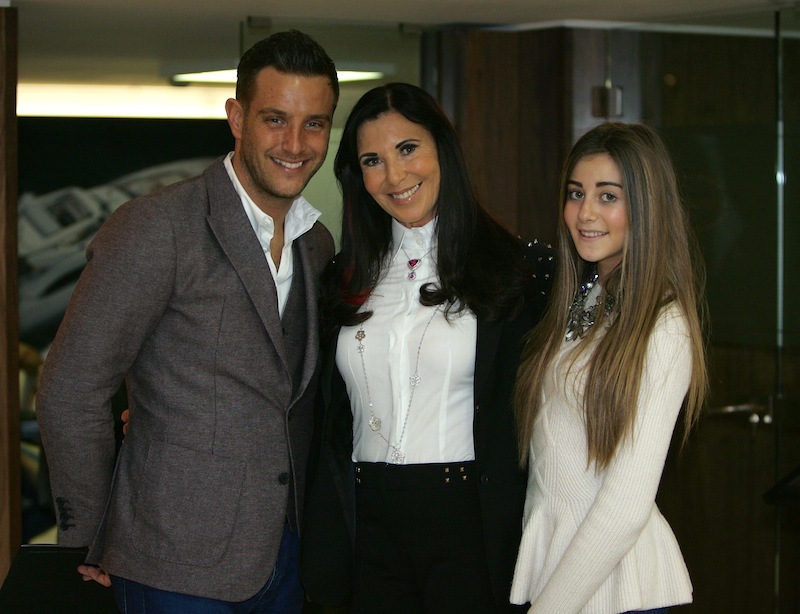 Sunseeker welcomed TOWIE personality Elliot Wright onto the stand, giving the reality TV star his own personal tour of several of the yachts on display, including the newly launched 75 Yacht. Elliot was kind enough to pose for the below photograph with Sunseeker London’s Alexis Lewis and her granddaughter, Megan. For more information on events with the Sunseeker London Group of Companies, please contact PR and Marketing Director Laura Harrison (Laura@sunseekerlondon.com / +44 (0) 207 493 3314).